A trailblazer in film and television, Dr. Angelou wrote the screenplay and composed the score for the 1972 film Georgia, Georgia. Her script, the first by an African-American woman ever to be filmed, was nominated for a Pulitzer Prize. 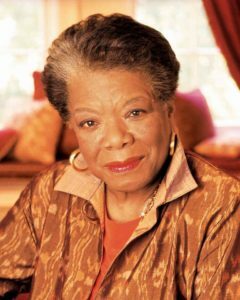 Dr. Angelou served on two presidential committees, was awarded the Presidential Medal of Arts in 2000, the Lincoln Medal in 2008, received three Grammy Awards, and held more than thirty honorary degrees. President Bill Clinton requested that she compose a poem to read at his inauguration in 1993. Dr. Angelou’s reading of her poem “On the Pulse of the Morning” was broadcast live around the world. In November of 2013, the National Book Foundation presented Dr. Angelou with the 2013 Literarian Award for Outstanding Service to the American Literary Community. Wake Forest University brought Dr. Angelou to North Carolina in 1982, naming her the first Reynolds Professor of American Studies, a position she held until her death. She called Winston-Salem home for more than thirty years. Maya Angelou reads her poem “On the Pulse of Morning” at the 1993 presidential inauguration of Bill Clinton. Maya Angelou visits Glide Memorial Church in San Francisco, CA. Ed Wilson, Professor Emeritus of English and Provost Emeritus of Wake Forest University, talks about Maya Angelou’s time in San Francisco and how she came by her name.